Levels of Listening explores how important listening is for effective communication. As Covey emphasizes in 7 Habits of Highly Effective People, most of our efforts to develop communication skills deals with reading, writing and speaking. But very little effort is placed on developing our ability to really hear the other person's perspective. This information can help you recognize and remove road blocks to listening. 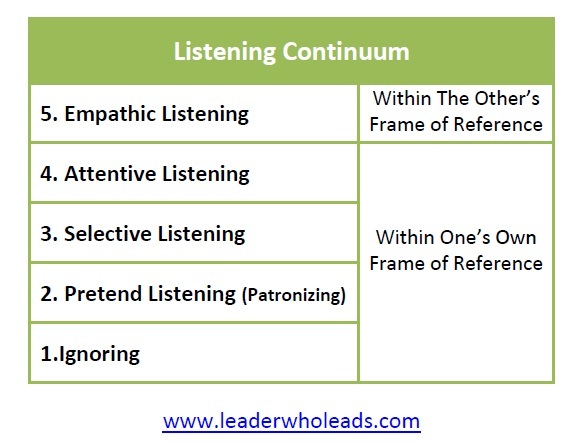 Stephen R. Covey's Listening Continuum identifies five(5) levels of listening. At the first four (4) levels, the listener hears with their own frame of reference in mind. But it is at Level 5 that true communication occurs. This is where the listener attempts to see things from the other person's perspective or point of view, not with your own filter/lense. If you have ever been ignored there is no doubt about it. You are talking but the other person is not giving any attention to what you are saying. Now, it is possible the person did not hear you. If that is the case, it is not ignoring. To truly hear someone takes time and attention. Pretend listeners give you the impression they hear what you say, and they may hear some of your words, but they are not "present." They may nod their head or offer another gesture to indicate they are listening, but they are not giving you their full attention. The next level is selective listening. The person who listens selectively only wants part of the message, but not all. They are probably the person who says, "So, what's your point?" They are quick to interrupt the person who is speaking or they have the tendency to finish the other person's sentences. Attentive listeners offer their time and attention. But they are one step short of being empathic listeners because attentive listeners hear from their frame of reference. They don't try to put themselves in the other person's shoes. Empathic listening is intentional. The person who develop this skill listens not only to the other person's words, they listen for what the other person means. They are willing to give their time AND full attention to truly hear the other person. "To truly listen means to transcend your autobiography, to get out of your own frame of reference, out of your own value system, out of your own history and judging tendencies, and to get deeply into the frame of reference or viewpoint of another person. This is called empathic listening. It is a very, very rare skill. But it is more than a skill. Much more." I came across this insightful study that investigates the relationship between effective listening and leadership. The author of the study, Battalion Chief Gregory L Rynders, reached this conclusion: "The results indicate that there is a positive relationship between effective leadership and effective listening skills. 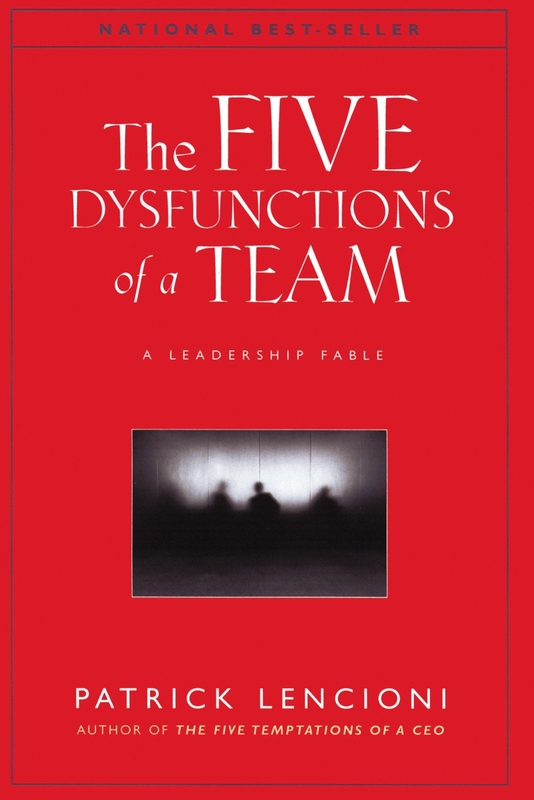 Effective leaders apparently hear what others have to say and empathize with their points of view." In the past, I had a really tough time hearing people out, especially when I disagreed. But over the years I have worked hard to develop my ability to listen. I am thankful for those who helped me to develop in this area. It requires work; and it is well worth the effort. As you can see, there are five(5) levels of listening. It is important to use the level appropriate for the occasion/situation.